Thank you to everyone who contributed to my AIDSWalk Kansas City fundraiser page! 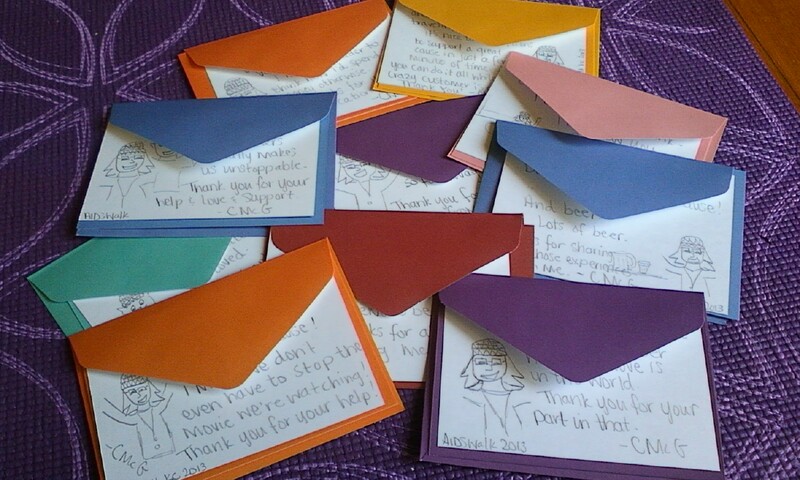 Together, we reached my $500 goal early in April, and I've been spending this month working on thank-you cards, hats, and other projects. 1) I get to practice my character drawing. 2) I get to practice showing my gratitude for all the people who help me do pretty much everything. 3) I get to practice cramming all that love into a 4x6ish card. The more we practice telling people we love them, the easier it gets. There are always new ways to love, appropriate ways to adapt love at the right time. So, I'm not done. I'm far from done. I'm never done. But, I'm getting pretty good at drawing myself wearing a stocking cap. Draw me in a stocking cap!! !